SAXON frontman Biff Byford is preparing to start recording his debut solo effort. He told Rock Bottom in a new interview that the music for the record is done, and he is presently working on the lyrics. "I'm doing my solo album next, so that will be done in one period," he said (see video below). "We'll probably start that in January." Asked if the solo LP will be musically along the same lines as SAXON, Biff said: "It'll be a bit similar, but not the same. There'll be a few surprises on there." Byford also talked about the upcoming 40th anniversary of the release of SAXON's debut album. "We're gonna do some big shows for that [in 2019]," he said. The concerts will likely last for two hours with "quite a lot of stuff going on, screens and things, about the old days," he added. "A bit of a nostalgic anniversary, really — 40 years." Asked if any of SAXON's former members will be involved in the band's 40th-anniversary celebrations, Biff said: "Could be, could be. Might only be on screen, but, yeah, they'll be part of it." 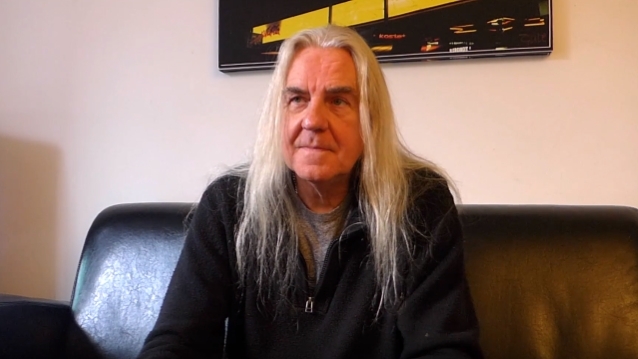 This past April, Biff told "Rock Talk With Mitch Lafon" that he had seven songs ready for his his solo album, and described their musical direction as "probably" be "a bit more rock and roll, a bit more classic rock" than SAXON's recent output. Although SAXON was formed in 1977, the band's debut LP didn't arrive until two years later. Byford and guitarist Paul Quinn are the sole remaining original members in the group's current lineup, which issued its 22nd LP, "Thunderbolt", earlier this year. Originally from South Yorkshire, England, SAXON has gone on to sell about 23 million albums and has produced such classic songs as "Denim And Leather", "Princess Of The Night", "Wheels Of Steel" and "Power And Glory". In addition to Byford and Quinn, SAXON's current lineup includes bassist Nibbs Carter, guitarist Doug Scarratt and drummer Nigel Glockler. SAXON is represented by X-ray Touring's Steve Strange, APA's Keith Naisbitt and Siren Artist Management's Adam Parsons.